On the race track, the Kawasaki ZX-10R is on one hell of a roll. In World Superbike, Jonathan Rea has a commanding lead, followed by teammate Tom Sykes, giving Kawasaki a stranglehold on the manufacturers points lead. Shane Byrne is leading the British Superbike championship on a Kawasaki and Kawi riders stood on the podium for every liter-class race at the Isle of Man TT. The ZX-10R is a steady winner on Sunday, but how does it handle Monday through Friday? Photo by Bucky Bautista. Racing success doesn't guarantee that a sport bike is the best choice for the real-world consumer, however. The ZX-10R is a race-inspired sport bike with heaps of technological goodies, but is it still comfortable enough to commute on? Go on longer rides? Luckily, ZLA Kawi-green-lighted me to live with the Zed-X10, as the rest of the world calls it, for a month. A visit to the race track, hours slabbing across the city, and hundreds of miles winding through the canyons ensued to determine if the bike works as well for us mere mortals as it does for the likes of Jonathan Rea. The 2015 Kawasaki ZX-10R. Kawasaki photo. Kawasaki has been marking the 30th anniversary of the Ninja line with special paint treatments, and that includes the 2015 ZX-10R, so two versions are available: the anniversary model in Lime Green/Pearl Stardust White paint with 30th Anniversary badges on the fairing, and the standard version in Metallic Matte Carbon Gray/Flat Ebony. Under the skin, there are no differences. The ZX-10R 30th anniversary edition costs $15,599 with ABS and $14,599 without, and the standard model is $300 less. The ABS models weigh in at a wet weight of 443 pounds, while the non-ABS models are seven pounds lighter. The ZX-10R is in its fourth generation (referred to as gen4 by Kawi buffs) and was redesigned from the previous generation in 2011. The gen4 got an Ohlins steering damper in 2013, but the biggest change was the introduction of Kawasaki's traction control and ABS systems (more on those later), along with improved suspension. A 998 cc liquid-cooled, inline four, 16-valve DOHC motor is supplied fuel by large 47 mm throttle bodies and sub-throttle valves, and secondary injectors for improved top-end power. Power output has remained unchanged from the previous year at 160 horsepower at 11,650 rpm and 73.4 foot-pounds of torque at 11,030 rpm. The bike also is equipped with titanium headers that are reported to be very close to the race-spec headers, thus eliminating the need to buy a full system if an exhaust upgrade is wanted. Objects in the rear-view mirror are right where you want them. Photo by Bucky Bautista. The front end receives a 43 mm inverted Big Piston Fork with adjustable, stepless rebound and compression damping. The fork also has easy preload adjustability and 4.7 inches of travel. The rear end gets a horizontal back-link gas-charged shock. Adjustability for the shock comes with stepless high-speed and low-speed compression damping, in addition to stepless rebound damping, fully adjustable spring preload, and 5.5 inches of travel. Kawasaki Intelligent anti-lock Braking System (KIBS) is supplied on the ABS model. The system was designed specifically for sport bike use and connects the ABS control unit to the engine control unit. As a result, the ABS considers not just wheel speed and brake pressure, but also throttle position, engine speed, clutch actuation and gear position. Both ABS and non-ABS models have dual, semi-floating 310 mm petal discs with four-piston radial-mounted calipers up front and a single 220 mm petal disc with an aluminum, single-piston caliper on the rear wheel. A crazy schedule meant I had just one day to familiarize myself with the ZX-10R before prepping it for a day at the track. For my first ride, I headed out to Malibu, my personal testing grounds, to determine if the bike needed any setup changes. Luckily, the Ninja felt like it was dialed in just for me, at 170 pounds with gear, so I mounted the Diablo Supercorsa SP tires Pirelli supplied for track testing and hauled the bike north to Monterey. The Kawasaki ZX-10R provides the best bang for your buck as a track-day ride. Photo by Matthew Termechi. As I rolled into the holy grail of U.S. race tracks, Mazda Raceway Laguna Seca, it was a pretty good day for riding, by Laguna standards: cold and dodgy grip in the morning, warm and sticky as the day pressed on. The Diablo Supercorsa SPs worked well in the dynamic conditions. The aggressive profile of the tires complemented the already-quick handling characteristics of the ZX-10R. I even found myself turning in and being on the apex too early sometimes, because the response to my inputs was so fast. This bike needs far less input on turn-in than my BMW S 1000 RR and the previous generation Yamaha R1s I have ridden. The Kawasaki's tall stock gearing was mismatched for the elevation change between turns five and the Corkscrew (turn eight). I found myself scrapping with a couple of Ducati Panigales throughout the day and they would visibly pull away up the hill to the Corkscrew. Shorter gearing would make the high-rpm power band more accessible on technical tracks like Laguna. That doesn’t mean the Zed-X isn’t fast, however. I still flew in the indicated low 150 mph range as I crested turn one. I even found myself wishing that the long run up to turn five was just a little longer, as the Kawi began to pull harder and harder in third gear, well above 100 mph. Testing the ZX-10R at Mazda Raceway Laguna Seca. Photo by Matthew Termechi. Setting the sag on the suspension is one of the most important things to do when you first take ownership of a sport bike. I highly suggest you find your local suspension tuner and have that dialed in. As mentioned before, the Kawi’s setup was perfect for my weight. The other suspension settings were the same. I never had to turn a single dial while at the track. Whether I was trail braking deep into Rainey Curve (turn nine), or wide open over turn one, the suspension kept me and the bike perfectly set through each curve, dip and undulating brake zone. Knowing that most racers and some track-day enthusiasts will not want the ABS version, I pulled the two fuses under the seat to disable the KIBS and see how the brakes worked without it. In the first couple of sessions, I found myself over braking at many of the heavy braking areas, such as turns five and 11. I even unexpectedly did my best impression of Dani Pedrosa’s stoppie at Motegi, riding on the front wheel into the sloping approach to turn two. The initial bite is great, but not as strong as the European liter bike systems. As you continue to add pressure to the lever, however, the bike slows much faster than you would expect. I would almost say the feel at the lever is a bit vague or spongy, but gets better once you’ve become used to the stopping characteristics. Whether the non-ABS ZX-10R feels the same as this version with the ABS disabled, I can't say. For the second half of the day, I reversed the life hack and restored the ABS system to see how it compared to having no electronics at the brakes. Where testing the ZX-14R at Big Willow left me guessing when the system would cut off the lever surging interjection, the ZX-10 was a day-and-night difference. Kawi’s KIBS does an amazing job of keeping the bike stable under braking. With KIBS disabled, the rear wheel stepped out under heavy brakes into turn 11, but with KIBS activated, that was completely eliminated. Unless you're like me, and like the bike moving around on you a bit, there is absolutely no reason to scrap the system if you’re not racing. After my day at Laguna Seca, I decided the ZX-10R is a top contender for best off-the-showroom-floor track weapon. Despite slower traffic, less than ideal gearing for Laguna, and a slightly cooler track, the bike was amazing. Even though it was my first time on the bike, I was able to turn laps not far off my personal best times at Laguna, below 1:40, which shows how easy it is to ride the ZX-10R and become one with the bike. Other race-inspired bits, like the position of the LED tach, race mode display, titanium headers, and cassette transmission eliminate the need for mandatory aftermarket upgrades. A slip-on exhaust and shorter gearing is all that is needed. Kawi also put some thought into making it easy for you to take your street bike to the track. Without having a manual to guide me, it only took me 20 minutes to yank off the mirrors and rear fender, signals included, thanks to convenient wiring couplers for easy removal. I'm sure the second go-around would only take me 10 minutes. The 2015 Kawasaki ZX-10R in 30th anniversary paint. Photo by Bucky Bautista. Track days are great fun, but most of us don't live at the track. I spent many miles commuting as the southern California weather returned to its 75-degree warmth. 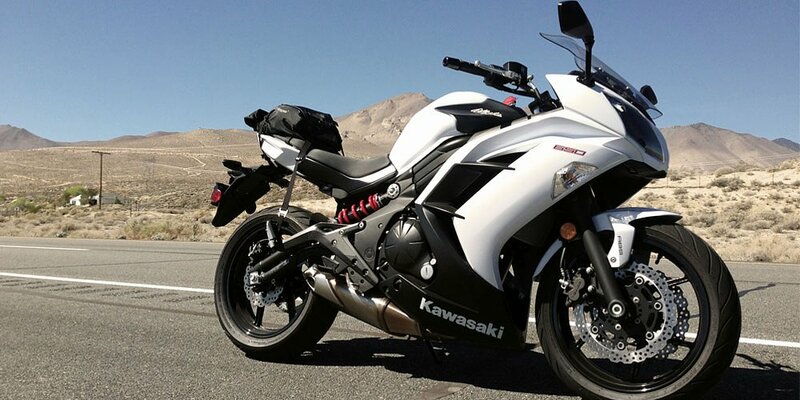 For a true sport bike, the Kawi has long been known to be one of the more comfortable rides. The bike felt compact as I traversed traffic during rush hour, but without the wrist-busting geometry of most 600s. I prefer the Kawi’s ergos to my Honda Fireblade. Adjustable handle bars are a nice feature to let you find your personal sweet spot. With my five-foot, nine-inch frame, I reached the controls past the small gas tank easily, not requiring any adjustments. The Zed-X offers two positions for the rear sets. You are able to lower the foot pegs a couple of inches if you find yourself taking a longer haul than to and from work, but I never needed to change them. The stock positioning never left my knees sore, even after a 280-mile round trip to the watch some races at Buttonwillow Raceway. The suspension did an adequate job of soaking up highway bumps. You are, after all, on a race-inspired machine, and not on a leisurely adventure-touring or sport-touring bike. The suspension is much more forgiving than that of Ducati Panigales and Aprilia RSV4s, for comparison. While you may or may not prefer the anti-lock brakes for track riding, the brakes are wonderful for public road applications. After testing the Z1000, I expected the KIBS to be close to flawless. I couldn’t get the rear to lift in panic-braking simulations. The surging feel at the lever is minimal, even at the high sensitivity setting. The tall gearing that did not fit Laguna is great for the streets. While it means there isn’t as much power at lower speeds, that makes for a less jerky ride in heavy traffic and a more forgiving throttle while leaned over in the canyons. Given the small margin for error on public roads, the taller gearing felt like a safety feature. The Kawasaki ZX-10R in the canyons. Photo by Bucky Bautista. Riding the Ninja in the canyons was the same kind of worry-free fun I had at the track. The Ohlins twin-tube steering damper is top notch. I recently experienced the tank slapper of all tank slappers on an RSV4 at the track, thanks to its next-to-useless steering damper. The shake was so violent the bike literally shut itself off (probably saving my life), while I thought I was going to yard sale Italian bits across the track. I never came close to that with the Ohlins on the Kawasaki. The Ohlins steering damper works great and the gauge display is complete and easy to use, even the LED tachometer. Photo by Bucky Bautista. Multiple functions on the LCD display, like average and real-time miles per gallon, encouraged me to see if I could keep my ham-fisted throttle hand under control on the highway. Kawasaki offers the Eco indicator on the LCD, but in reality, it turns off just past a maintenance throttle. The indicated fuel consumption and average mileage were very accurate, compared to my calculations. Overall, the bike averaged 34.88 mpg and had a range of 137 miles with half a gallon left in the tank. Straight from the factory, this may be the best stock liter bike for the price. As mentioned before, the only upgrades I would suggest are a slip-on pipe (no need for a full system) and shorter gearing for the track. Handling is quick but stable. Usually, you have to make a compromise to try to find a happy medium, but with a great electronics package, you don’t have to sacrifice corner exit stability for faster turn in. As mentioned above, KIBS works great on the street and will be the best choice for most people at track days, too. It's good to see what an ABS system can do when it's specifically designed for sport bike use. The gauge cluster is well thought out: LED tach on the top for visibility, accurate fuel consumption display, and a “Race Mode” that moves the gear indication to the center of the LCD display for better visibility. The bodywork is sleek and sharp. I had random, non-riding people comment on how sharp and good looking the bike was. The 10R is designed with very few bodywork screws showing. The bike quickly and easily converts to track-ready mode. All you have to do is remove the mirrors and unplug the wires for the integrated signals. Then, remove the passenger seat to access wire connectors, and a few bolts to release the rear fender. Although not entirely needed, faster track-day riders might want to look into replacing the stock front brake lines with some better aftermarket steel lines. Good enough for street use, I prefer a firmer feel at the lever for track use. I did notice a slight fade in the brakes at the track, but not while I rode the bike on public roads. An intermediate-level rider will probably never notice any issue with the stock lines. While the electronic rider aids are top-notch, I would like some flexibility to adjust traction control and ABS separately, instead of three modes covering both electronics. Ducati, Aprilia, and Yamaha allow you to adjust the electronics individually, and with the new Yamaha YZF-R1, with its more advanced electronics package, coming up for ZLA testing, the bar is only getting higher. There is a buzzing sound coming from the upper section of the plastics at low rpms. I couldn’t pin point if it was a flap for the intake, or just loose plastics buzzing from the low-end vibration from the motor. It doesn’t seem to be a problem other than slightly annoying. You will have to get used to riding the clutch when launching from a stop, whether at the traffic light or the race track. The gearbox simply doesn’t like to hook up like other liter bikes. My racer friend says the same thing about launches, but he says the bike makes up for it on the power and handling within the first couple of turns in a race. The 2015 Kawasaki ZX-10R. Photo by Bucky Bautista. The superbike class is hot right now, with various redesigns. For simplicity, I will look at the bikes that offer similar features as the ZX-10R ABS model. I will forgo the Honda and Suzuki, since they have yet to offer a complete electronics package. Among the rest, the Kawasaki is the most affordable bike that offers a complete electronics package and it is in the middle of the range in terms of weight. The huge wild card right now is the new Yamaha YZF-R1 and R1M, which bring a new level of electronic aids to the consumer. In addition to the electronics, the standard R1 model brings seven more horsepower (167.4) than the Zed-X, but is also more expensive at $16,490. We'll have a test of the R1 coming soon, but for now, I haven't been able to compare it to the ZX-10R. The Aprilia RSV4 offers additional features that the Kawasaki doesn't have, such as a quick shifter, launch control, and wheelie control. I got a chance to dial in a friend’s previous model RSV4 at the track, and I loved how user friendly it was. I could dial down the ABS while I kept the TC up so I didn’t have to pay for a friend's bike, although I still almost did, thanks to its useless steering stabilizer. The cheapest European option at $15,499 for the base model, the RSV4 is only $200 more than the Kawi and is very close in power. You also get the intangible benefits of the only V-4 engine configuration in the class and Italian styling. The other Italian option, of course is the Ducati Panigale 1299. A twin instead of a four-cylinder, the base Panigale is lighter, more powerful, and considerably more expensive at $19,295. Add $5,000-plus for the Panigale S. It's really a different class of bike, at that point. The BMW S 1000 RR is more direct European competition. The BMW not only outpowers the Kawasaki, but also provides even more sophisticated electronics, such as the Shift Assistant Pro, which allows clutchless downshifts. It's part of the "standard" package, which puts the BMW at $16,795. Step up to the "premium" package, which includes Dynamic Damping Control (DDC), which electronically adjusts the suspension, and you'll quickly find yourself in the $19,000 neighborhood. In the city. Photo by Bucky Bautista. Manufacturers have been lavishing attention on their liter-class sport bikes lately, and I expect to see Honda and Suzuki playing catch-up with electronics packages to match the competition. After riding the ZX-10R on the track and the street, I can recommend it without any reservations, especially since it comes in as the least expensive option with a full electronics package. There's one big "if," however, and that's the Yamaha YZF-R1, which I haven't ridden yet. The additional features in the Yamaha's electronics could make me willing to pay a $900 premium over the Kawasaki, but I'll reserve judgment until I've ridden it. Meanwhile, you can't go wrong with a ZX-10R. Being 1-2 in the World Superbike standings doesn't always mean a sport bike is going to be a good choice for the rest of us to ride on the street and at track days, but in this case, the Kawasaki lives up to the reputation it is building on the race track.